A Syrian refugee boy holds up a placard in Arabic, during class at a remedial education center run by Relief International in the Zaatari Refugee Camp, near Mafraq, Jordan, Jan. 21, 2016. On a recent program, we told you about some English words borrowed from African languages. Today, we will tell you about words English has borrowed from the Arab world. Arabic words entered the English language through a number of ways. In the early 8th century, Arab fighters invaded and took control of the Iberian Peninsula, or what is modern day Spain and Portugal. These forces were known as the Moors. During their occupation, their language spread throughout the area, and entered Latin, the language spoken by the locals. Over the next several centuries, Christian-led forces took control of the Iberian Peninsula. However, by this time, the language spoken there had been forever influenced by the Arabic language. Many of these words have survived. As Latin began to influence English, some of the Arabic words were passed on. To this day, many words commonly used in English have Arabic roots. Algebra is a widely used system in mathematics. It uses symbols, instead of numbers, to solve problems. Algebra is also one of the oldest forms of mathematics. Some of the earliest notes with algebraic formulas were found in Egypt and what is now Iraq. 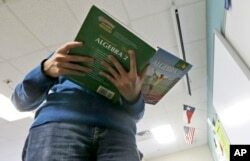 A student holds an Algebra textbook. The word algebra entered the English language sometime in the 15th century. Word historians believe it probably came from Arab medical workers in Spain. At first, the English word meant “bone-setting,” likely from a medical process of setting broken bones. The English word alcohol comes from the Arabic word al kohl. Al is the definite article in Arabic, acting much like the word the in English. The original meaning of kohl was a powder, or fine particles, that was added as makeup around the eyes. It is not clear how this word came to mean a drink. But a common belief is that this happened after the word alcohol entered the English language. The term was once used for the powder produced from sublimation of natural minerals. The meaning was later changed to refer to when substances were purified to create ethanol, a kind of alcohol that can be drunk. 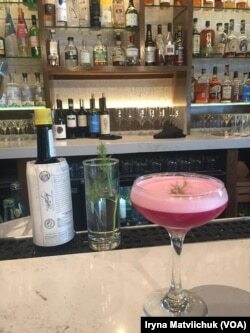 Alcohol is now the most common English word for the colorless, but often powerful liquid in some drinks. 26 year old Chan you-yue opens a coffee cafe in Tainan of Taiwan. Long ago, traders sold coffee beans throughout the Middle East, and later to Turkey, where it was called kahveh. Coffee eventually came to Europe, arriving in Italy, where it was called caffe. By 1650, the drink had arrived in England. By then, the name had changed to the sound it has today, coffee. Some food names also have Arabic roots, such as a common fruit: the lemon. Like many Arabic words in English, the word became part of Latin and other romance languages before finally entering English. There are several stories about the origins of lemons. Some experts say they came from India, while others have said it was closer to China. 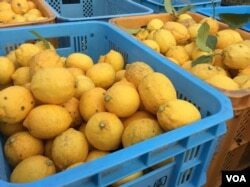 Some records show that Arab traders eventually brought lemons from India to the Middle East. In Arabic, they were called laimun. The fruit later found its way to Spain, and then spread across Europe. The word entered the French language, and was called limon. In modern use, the English word lemon sometimes suggests difficulty. The word is often used in the expression: “If life gives you lemons, make lemonade.” This means that you should always be hopeful and move forward, even during difficult times. Many people do not realize it, but the Arabic language influenced the numbering system used in most English-speaking countries. It is called the Arabic Numeral System, or the Hindu-Arabic Numeral System. 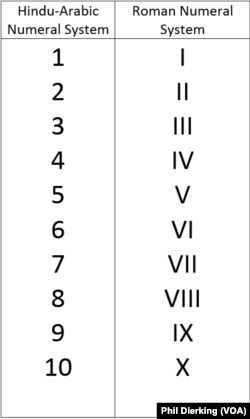 Numbers 1-10 in the The Hindu Arabic System and the Roman Numeral System. ​Many experts say it was the mathematician Al-Khwarizmi who was responsible for spreading the Hindu-Arabic numeral system throughout the Middle East, and later to Europe. Gerbert of Aurillac has been credited with bringing Arabic numerals to Europe after he visited the Iberian Peninsula while under Moorish rule. He later became head of the Roman Catholic Church and was known as Pope Sylvester II. By the 15th century, the Hindu-Arabic numeral system replaced the Roman numeral system that had been used in Europe. I’m Phil Dierking. And I'm Alice Bryant. This story was written by Phil Dierking for VOA Learning English. George Grow was the editor. Can you think of any other English words that originated from Arabic? We want to hear from you. Write to us in the Comments Section or on our Facebook page.